The easiest endurance crackers to make provided for you right here! Hi, it’s Ashley Grimmel, An Oasis Of Healings Nutritionist and Health Educator. 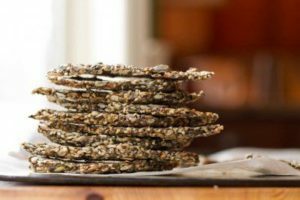 I have for you today, the easiest endurance crackers to make that packs high protein, high fiber, and healthy omega 3 fats. Plus they can be seasoned any way you like: sweet, spicy, italian style, the possibilities are endless. The Easiest Endurance Crackers Ingredients! Prepare 1 or two dehydrator trays with Teflex sheets. Add the water and salt. Stir with a spatula until combined. Allow the mixture to sit for a couple of minutes until the chia seeds absorb the water. After the 2 minute rest, when you stir the mixture, you shouldn’t see a pool of water on the bottom of the bowl. With the spatula (and a hand, if necessary), spread the mixture onto the prepared teflex sheets and form two small rectangles, about 12 by 7 inches each and 1/8 to 1/4 inch thick. Sprinkle additional salt on top. You can also freeze the crackers in glass containers for up to 1 month. If the crackers soften while storing (this can happen in humid environments), place crackers back into the dehydrator. We hope you enjoy this wonderful, tasty healthy treat!